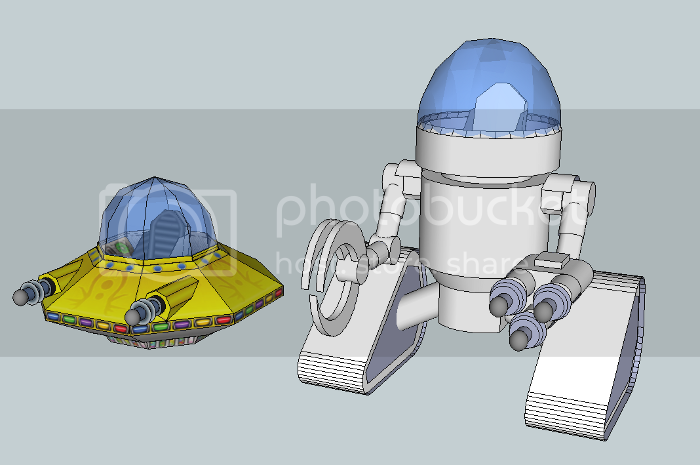 I've been working on a robot to go with my UFO sort started them at about the same time. I've aimed for sizing around the medium vehicle size. I'm still working on the mesh on this one and I haven't built a prototype yet. Most of the hard parts I built up as part of the UFO so I'm fairly certain it'll work. The arms might end up needing some re-work. edit: forgot to ask does anyone have any suggestions for making cabling on a paper model, best solution i've seen so far is that paper florist wire. Very inspired! I may just have to design an invader pilot figure for these sets.